Hello again, dear followers of the Mesier Family history! Lately I’ve been working on the homestead’s tour for the Fall Festival which is fast approaching. That project has been coming along well and I think we’ll have a pretty interesting tour for the public come October 18th. I can’t give too many details here, so you’ll just have to come by the homestead and see for yourself! Isn’t it beautiful? 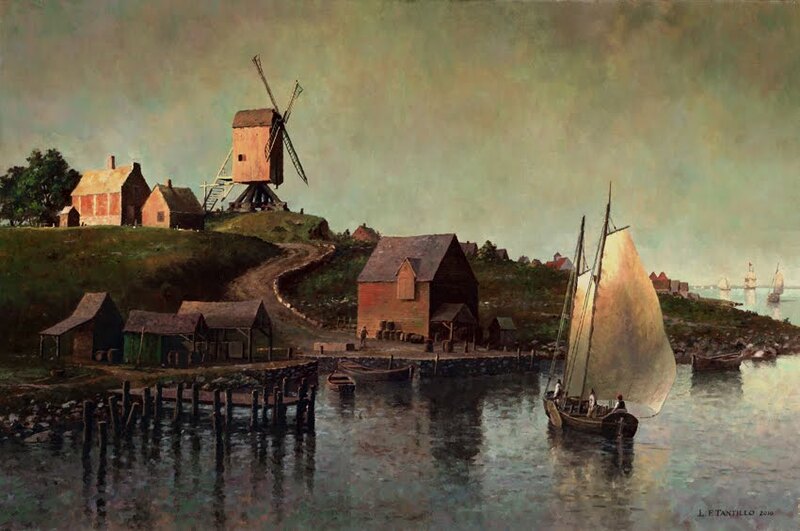 The Mill, as depicted, is interesting in itself with its great Dutch-style character. I love it; seeing the painting provokes me further to unearth the story behind it and it’s apparent relevance to the Mesier family. When Len Tantillo got back to me, I was very excited. The mill has had much of my attention regarding the project and I’m desperate to learn more about it. He was very helpful and shared lots of information – particularly a extremely intriguing connection! He told me that he was commissioned to paint the mill by a man named Andrew Hendricks, a descendant of the Mesier Family. I was surprised at this information – we haven’t been in contact with any descendants of the Mesiers besides the Reese family. Immediately I wanted to connect with Hendricks, who provided the research he’s personally done in order for Tantillo to accurately depict the mill. Tantillo was kind enough to share Hendrick’s contact information, and I emailed him immediately. Speaking with Tantillo was amazing. His work is absolutely beautiful, and at the homestead we feel so lucky (shocked, astonished, amazed!) that this wonderful painting of the Mesier Mill by such a talented artist exists. Tantillo was happy to know about the Mesier Homestead as well, and offered to sell us prints for the museum, at a discounted price, of his works that depict the Mill nestled on the bluff. Everyone here is eager to have prints of the paintings for the homestead – so thank you, Len Tantillo! Len Tantillo’s Mesier Mill, c. 1695 is currently on display at the Fenimore Art Museum in Cooperstown, New York. There the painting, along with 24 other original works, are on display in the exhibit titled A Moment Past: L. F. Tantillo Paints New York History until December 30th. The exhibit catalog is available for purchase online through Amazon. Read Len Tantillo’s short biography here.